In a good/bad mood (Short video) - Learning English is AS EASY AS PIE with Phrases, Idioms, Expressions. 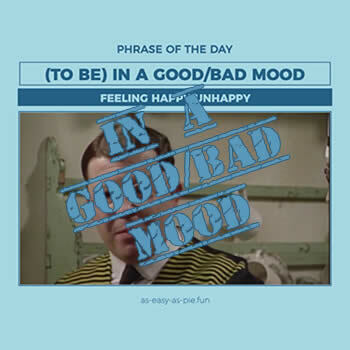 The phrase of the day is: "In a good/bad mood"
If you are in a good mood, you feel cheerful. If you are in a bad mood, you feel angry and impatient.